This beautiful pond looks so real, I can almost hear the koi swimming around in the water. 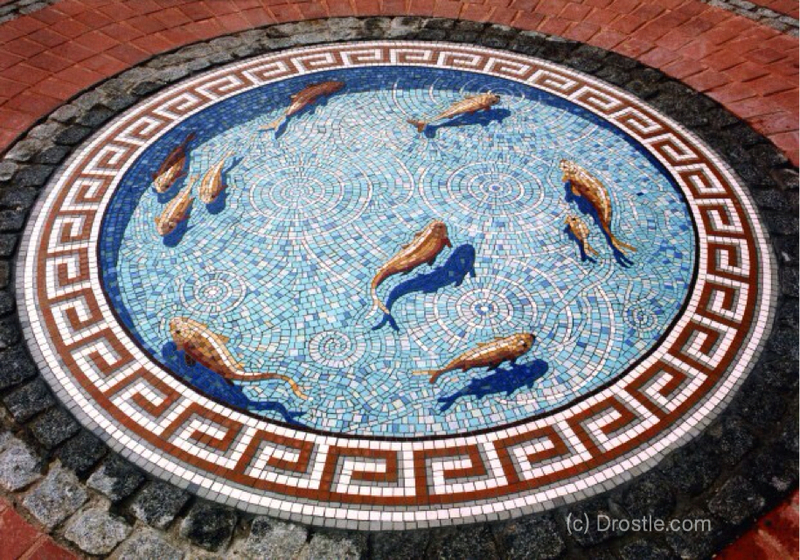 Designed and created by UK mural and mosaic artist, Gary Drostle, this 3-dimensional looking pond fools the eye into believing that this is real by incorporating shadows both on the left side of the pond and under each fish. The shadows give the whole scene depth and perspective. And I LOVE how he created the illusion of ripples and movement in the water by laying the “water” tiles in concentric circles, with curvy and spiral patterns. Very clever! This fishpond mosaic forms the central feature in an award winning small public garden in the business area of central Croydon. Designed by Gary from a “do what you like” brief the mosaic is made from vitreous ceramic tesserae using the reverse technique and measures 2 metres in diameter. The mosaic displays the finest traditions of the craft as well as combining a relaxing and interesting trompe L’oeil design with a sense of humour, the ideal low maintenance fishpond. Because koi fish can develop such an array of colors, it comes as no surprise that each hue has developed a connotation. Gold koi fish represent wealth and prosperity. Metallic koi symbolize success in business. A blue koi is thought to bring serenity. Asagi koi of blue, red, and grey colorings symbolize positivity. Black koi are thought to hold a patriarchal symbolism, with red belonging to the mother, blue to the son, and pink to the daughter.